soft and moist sour cream cake made with whole wheat flour with a streusel filling. 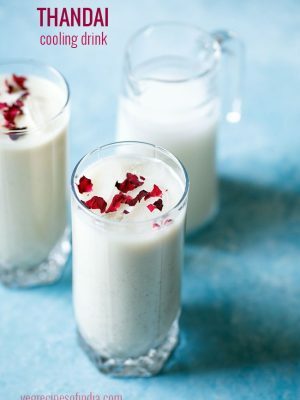 fresh curd or yogurt can be substituted in place of sour cream. sour cream coffee cake recipe with step by step pics. this eggless sour cream cake was one of the best cakes i have made during recent times. it has a soft and moist crumb. 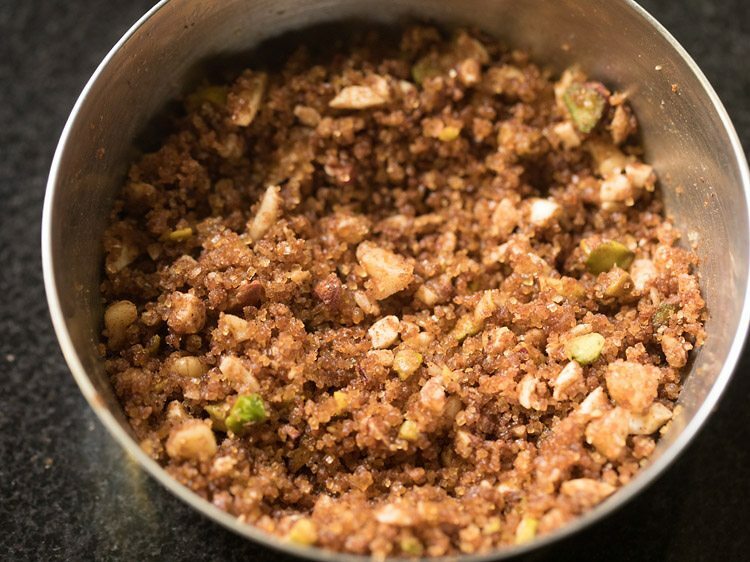 the cinnamon flavored streusel stuffing is like an icing on the cake. the crunch and sweetness of the dry fruits in the streusel is in contrast with the softness of the cake and tastes too good. sour cream cake is called as a coffee cake, but do not get misled. there is no coffee added in the cake. 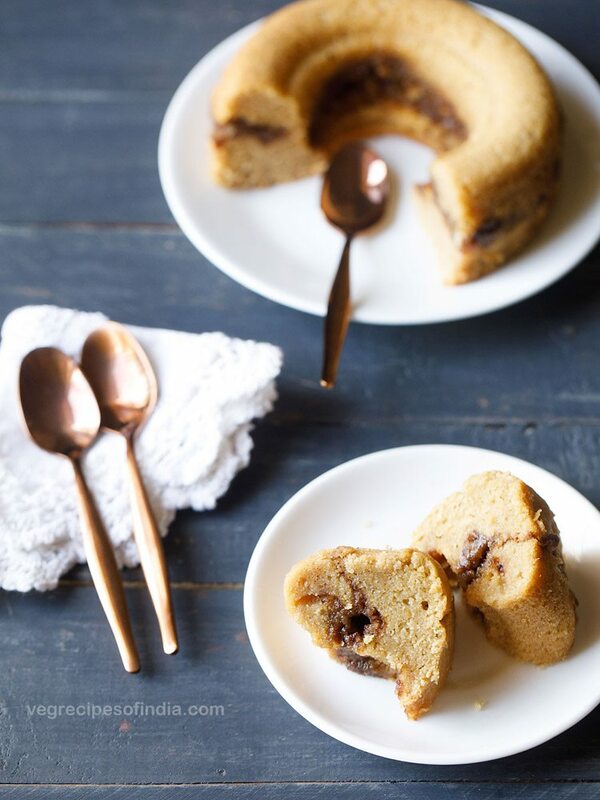 this cake is served with coffee and thus called as coffee cake. so basically this cake recipe is of an eggless sour cream cake. i had some sour cream left after making the vegetarian tacos. so was wondering what to do with the sour cream. checked my books and saw a cake made with sour cream. so the recipe is loosely adapted from the cook book “bakin’ without eggs: delicious egg-free dessert recipes” by rosemarie emro. 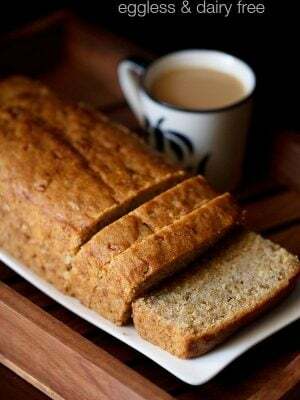 this cake is egg free and makes use of whole wheat flour. 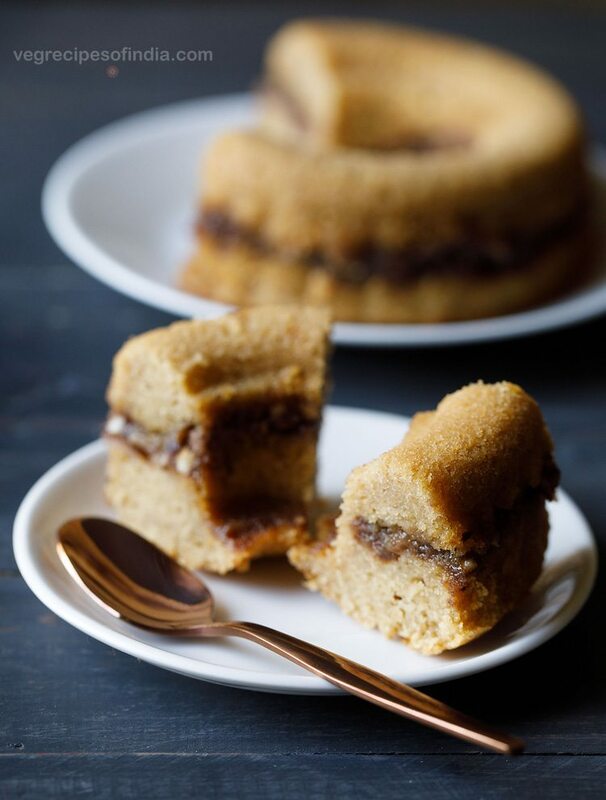 the denseness of whole wheat bakes is not felt in this cake. even though sour cream is used, but you can easily make this cake with fresh curd or yogurt. even low fat sour cream or low fat yogurt can be used. i have mixed and beaten all the ingredients in a stand mixer. but you can use a handheld electric beater also. 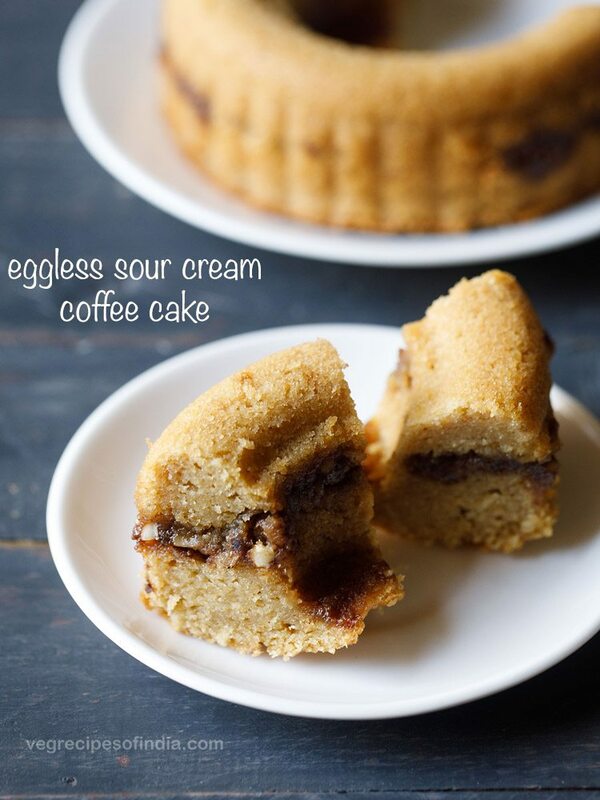 eggless sour cream cake can be served as a coffee cake. you can even serve as a tea time cake or as a dessert after meals. grease 2 bundt cake pans (5.5 inches diameter) with butter. you can also use a 7.5 to 8 inches round pan. 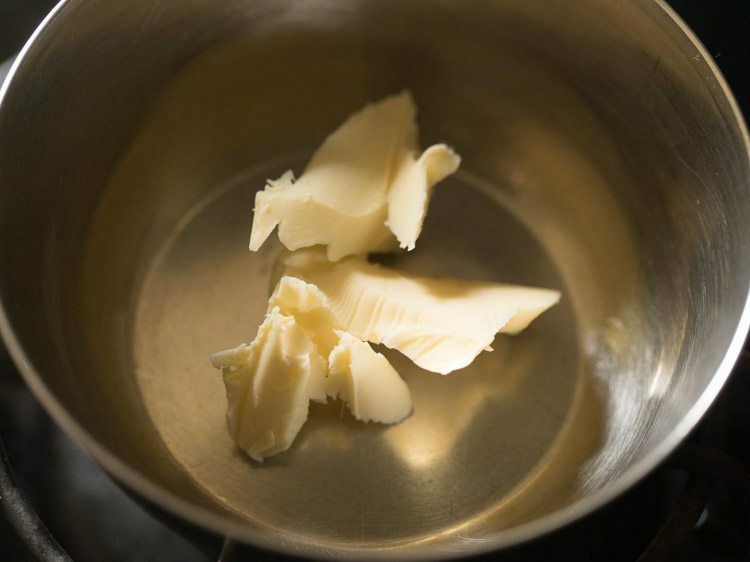 in a bowl take 1 tablespoon unsalted butter. on a low flame begin to melt butter. you just need to melt the butter. remove the bowl from the stove burner and keep down. add ¼ cup finely chopped nuts. you can use any crunchy nuts. i have added an equal mix of chopped pistachios, cashews and almonds. then add 4 tablespoons brown sugar, 1 tablespoon whole wheat flour and 1 teaspoon cinnamon powder. mix very well. keep the streusel filling aside. 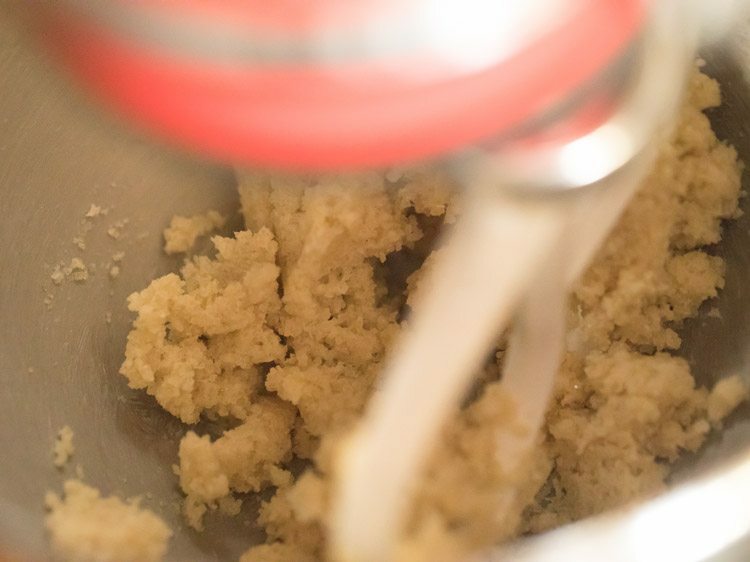 in a mixing bowl or a stand mixer bowl take 150 grams sugar (¾ cup sugar) and 57 to 60 grams softened unsalted butter (¼ cup unsalted butter). meanwhile preheat oven at 180 degrees celsius for 20 minutes. 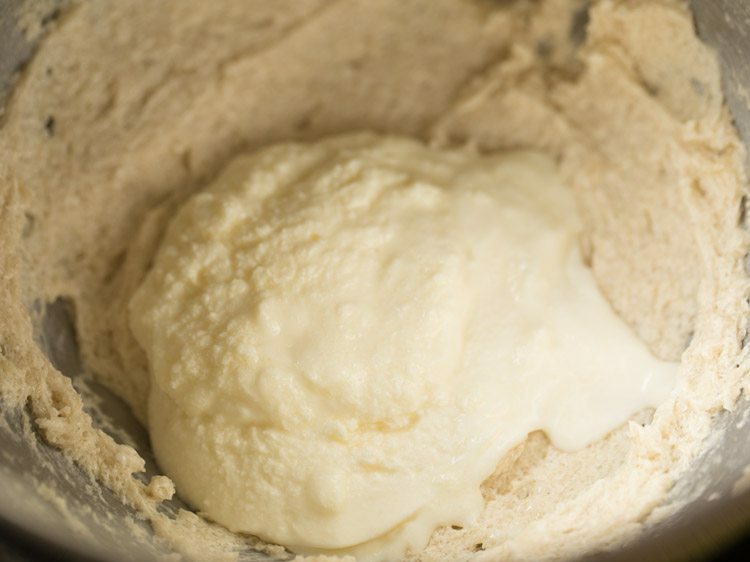 using the paddle attachment of a stand mixer, beat on medium to high speed till butter becomes fluffy. scrape the sides while beating. then add 1 teaspoon baking powder, ½ teaspoon baking soda, 1 teaspoon vanilla extract and 1 tablespoon apple cider vinegar or lemon juice. you can even add ½ teaspoon vanilla essence or 1 tablespoon white vinegar. beat on medium speed for 30 seconds. add 110 grams sour cream (½ cup). instead of sour cream you can also use fresh curd or yogurt. 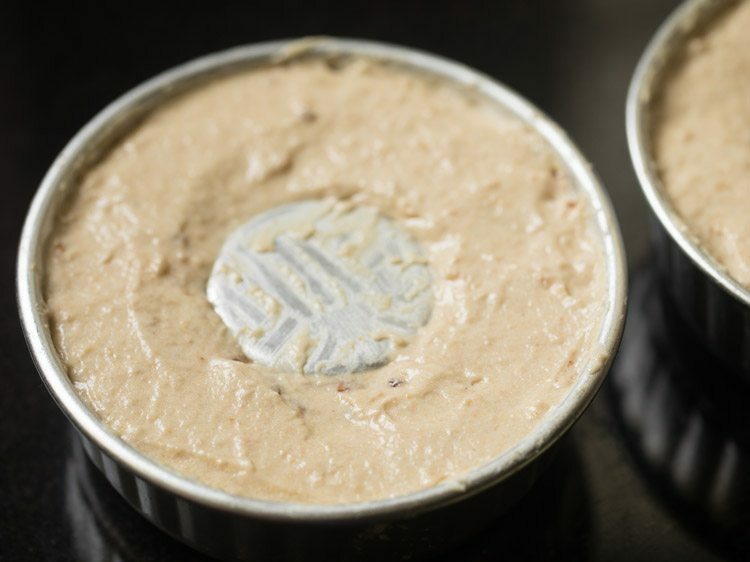 do make sure that the curd is thick and not thin or watery. beat on medium low speed for 30 to 45 seconds. add 180 grams whole wheat flour (1.5 cups) and 1 to 1.25 cups water or add as required. beat on low speed for a minute or more till everything is mixed well. if there are many lumps then beat for some more seconds. do not over beat. if batter looks very thick then add more water. i used 1.25 cups water. 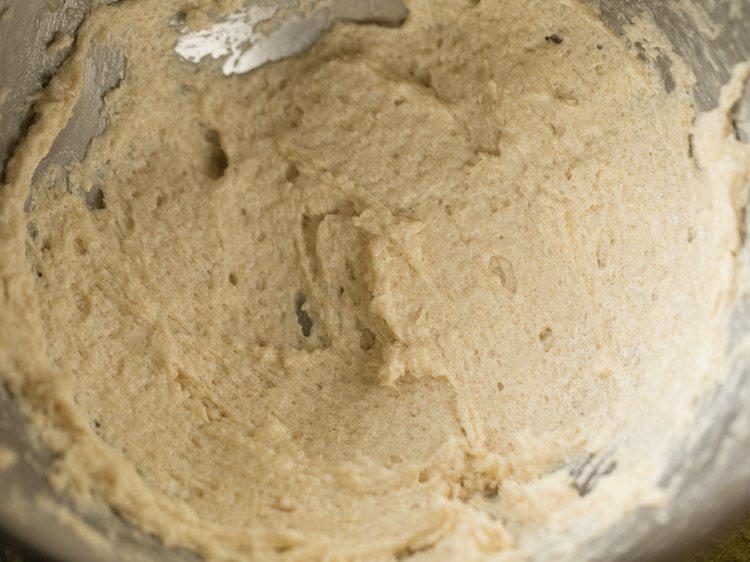 the batter consistency is thick like an idli batter. some tiny lumps are fine in the batter. 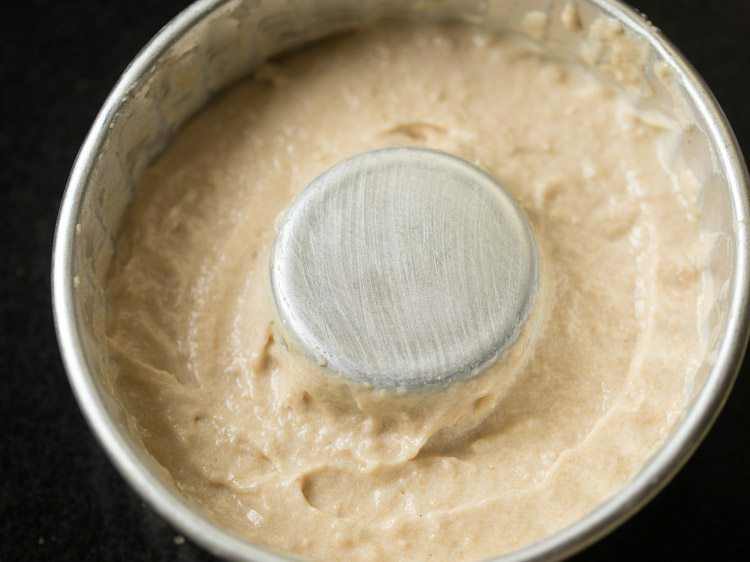 take spoonfuls of the batter and place it in the greased bundt pan. fill till ⅓ of the volume of the bundt pan. using a spatula even the batter. now take spoonfuls of the prepared streusel stuffing and top it all over evenly on the cake batter. again add some batter and fill it till ⅔ or ¾ ᵗʰ volume of the pan. 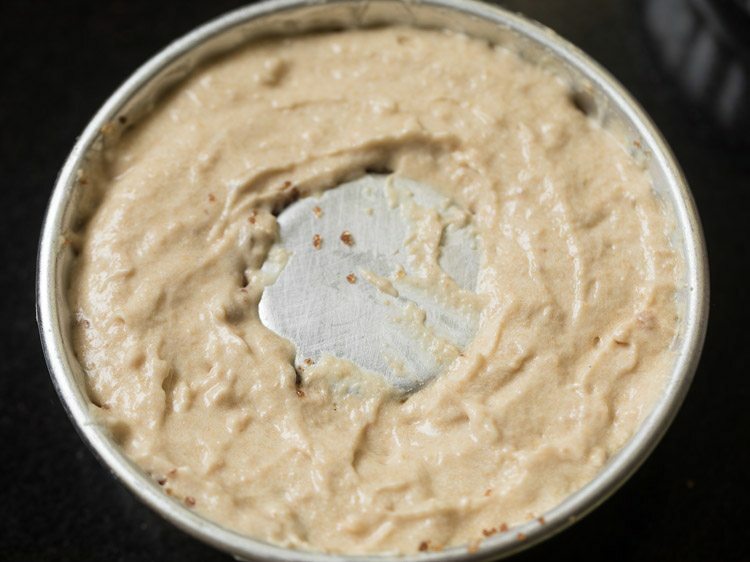 with a spatula make the batter even from top. 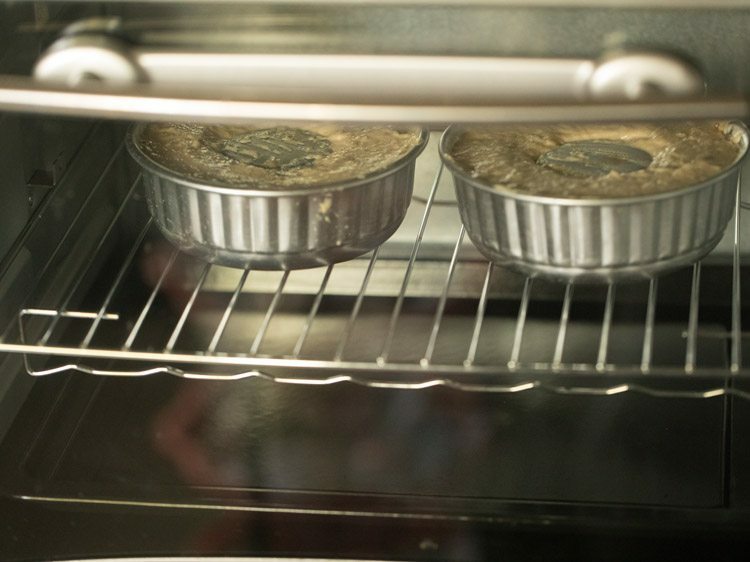 place the cake pans in the preheated oven in the center rack. if using an OTG, then use the bake option where only the bottom heating element is heated. bake sour cream coffee cake at 180 degrees celsius for 45 to 50 minutes or till the top is golden. since temperatures in ovens vary, do keep a check. 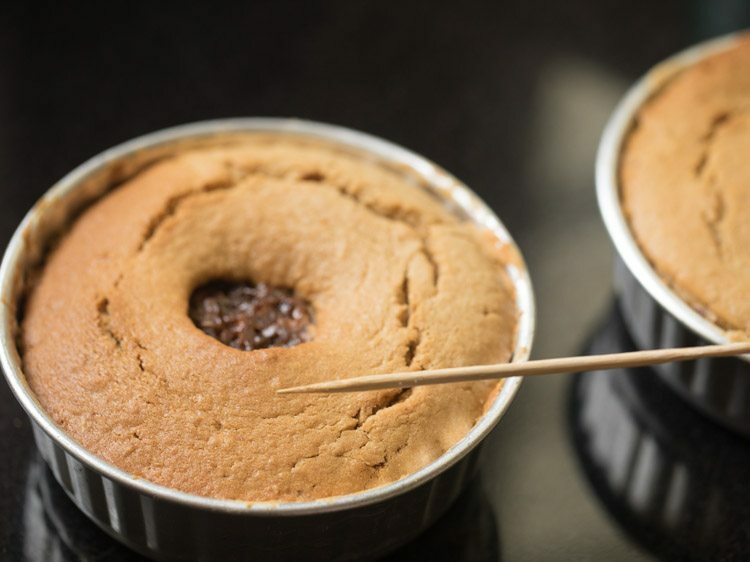 to check doneness, insert a wooden skewer in the cake and it should come clean. if there is sticky batter on the skewer, this means the cake needs to be baked for some more time. for cooling keep the cake on a wired rack. when cooled completely, unmould the cake from the pan. slice and serve streusel sour cream coffee cake with coffee or tea or as a dessert. 1. grease 2 bundt (5.5 inches) pans with butter. 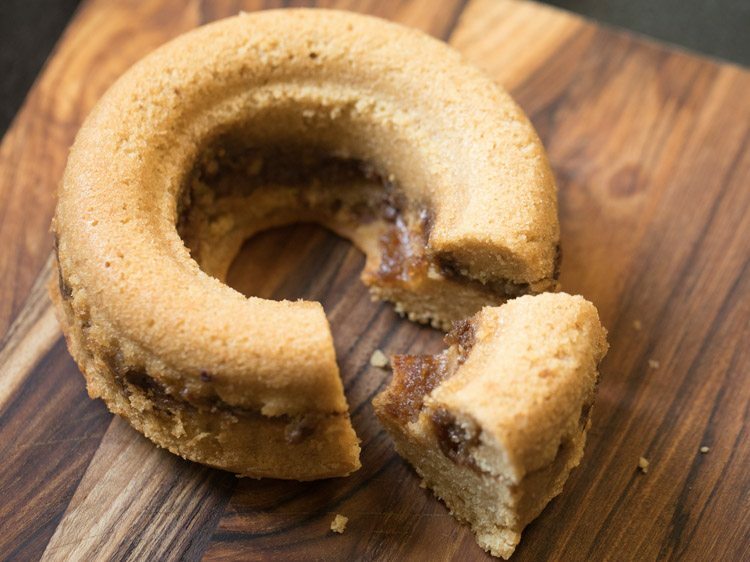 you can also use a 7.5 to 8 inches round pan or 1 large bundt pan. 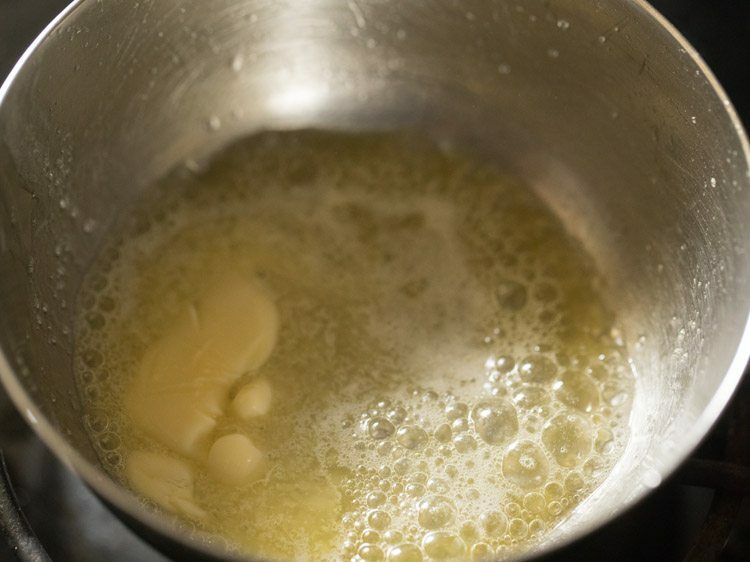 2. in a bowl take 1 tablespoon unsalted butter. 3. on a low flame begin to melt butter. you just need to melt the butter. 4. remove the bowl from the stove burner and keep down. 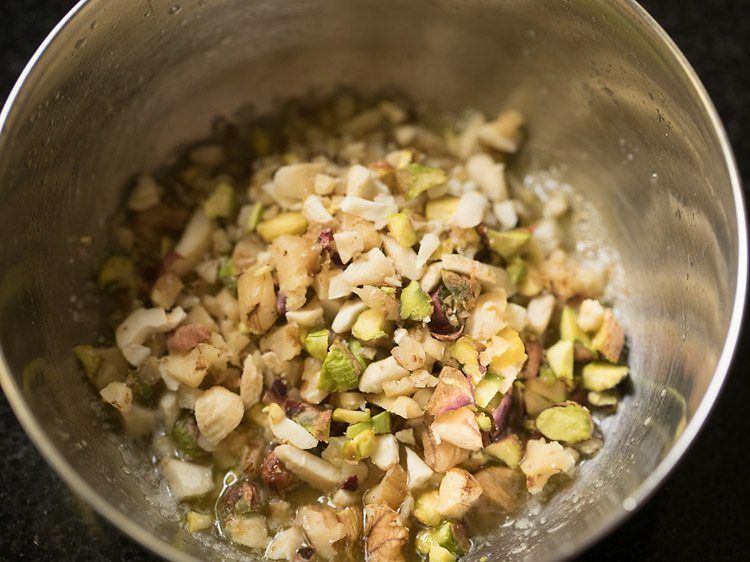 5. add ¼ cup finely chopped nuts. you can use any crunchy nuts. i have added an equal mix of chopped pistachios, cashews and almonds. 6. then add 4 tablespoons brown sugar, 1 tablespoon whole wheat flour and 1 teaspoon cinnamon powder. 7. mix very well. keep the streusel filling aside. 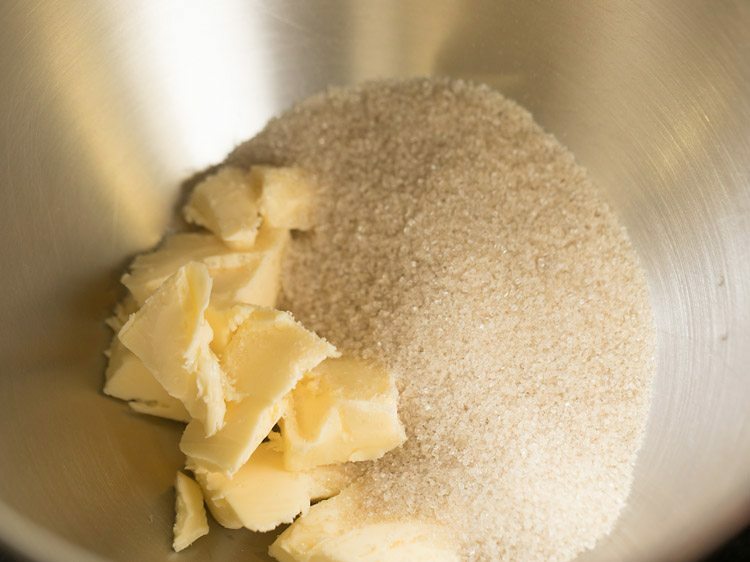 8. in a mixing bowl or a stand mixer bowl take 150 grams sugar (¾ cup sugar) and 57 to 60 grams softened unsalted butter (¼ cup unsalted butter). meanwhile preheat oven at 180 degrees celsius for 20 minutes. 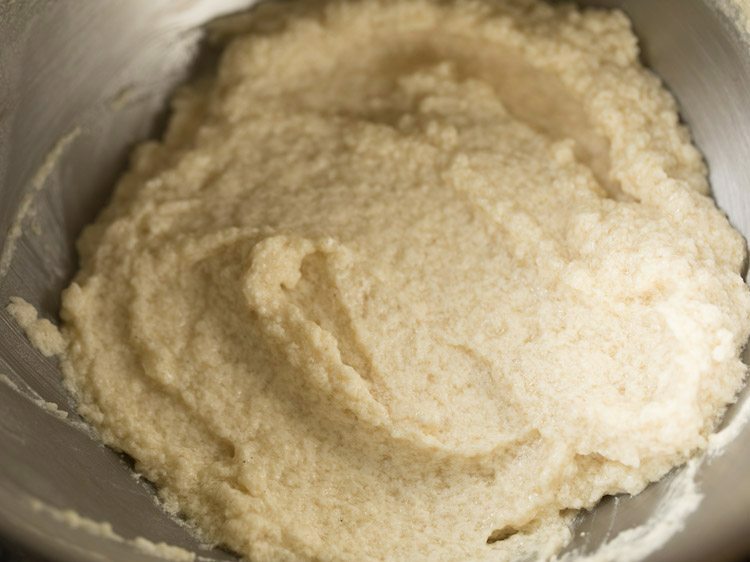 9. using the paddle attachment of a stand mixer, beat on medium to high speed till butter becomes fluffy. you can also use a hand held electric beater to whip butter. 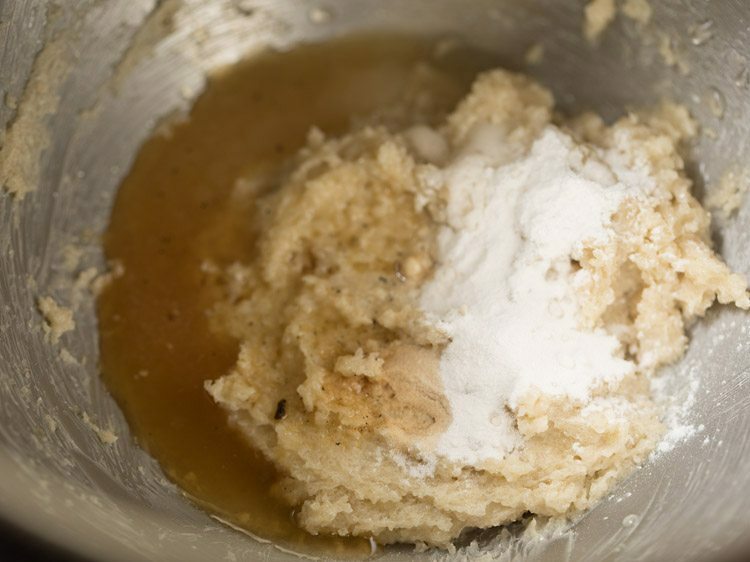 10. the butter sugar mixture should become fluffy. it won’t become very fluffy but should become loose. so beat well. 11. add 1 teaspoon baking powder, ½ teaspoon baking soda, 1 teaspoon vanilla extract and 1 tablespoon apple cider vinegar or lemon juice. you can even add ½ teaspoon vanilla essence or 1 tablespoon white vinegar. 12. beat on medium speed for 30 seconds. 13. add 110 grams sour cream (½ cup). instead of sour cream you can also use fresh curd or yogurt. 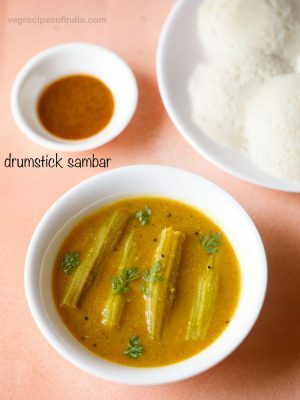 do make sure that the curd is thick and not thin or watery. 14. beat on medium low speed for 30 to 45 seconds. 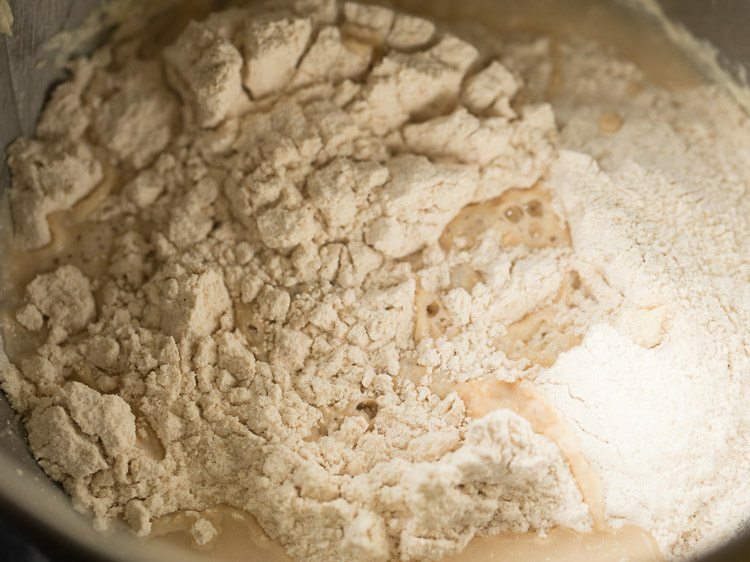 15. add 180 grams whole wheat flour (1.5 cups) and 1 to 1.25 cups water or add as required. 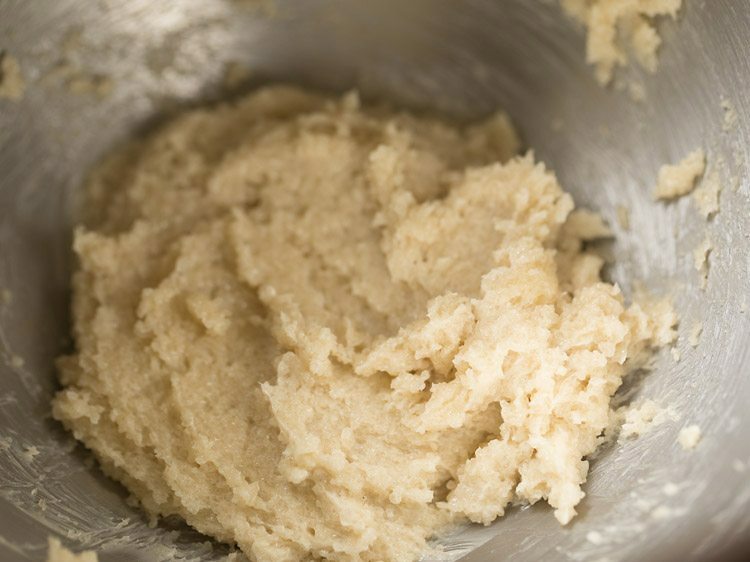 you can first add 1 cup water and if the batter looks thick, then add ¼ cup water later. 16. beat on low speed for a minute or more till everything is mixed well. if there are many lumps then beat for some more seconds. do not over beat. 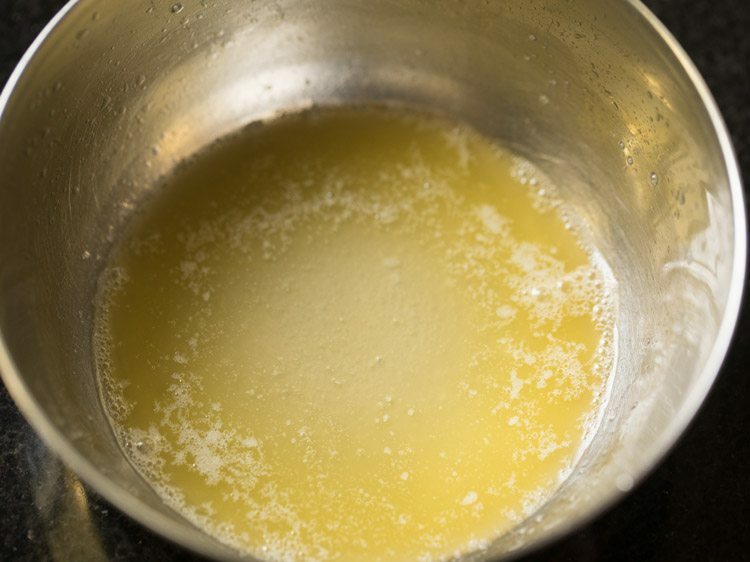 if batter looks very thick then add more water. i used 1.25 cups water. 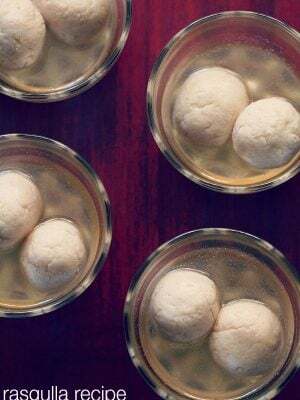 the batter consistency is thick like an idli batter. some small lumps are alright in the batter. 17. take spoonfuls of the batter and place it in the greased bundt pan. fill till ⅓ of the volume of the bundt pan. using a spatula even the batter. 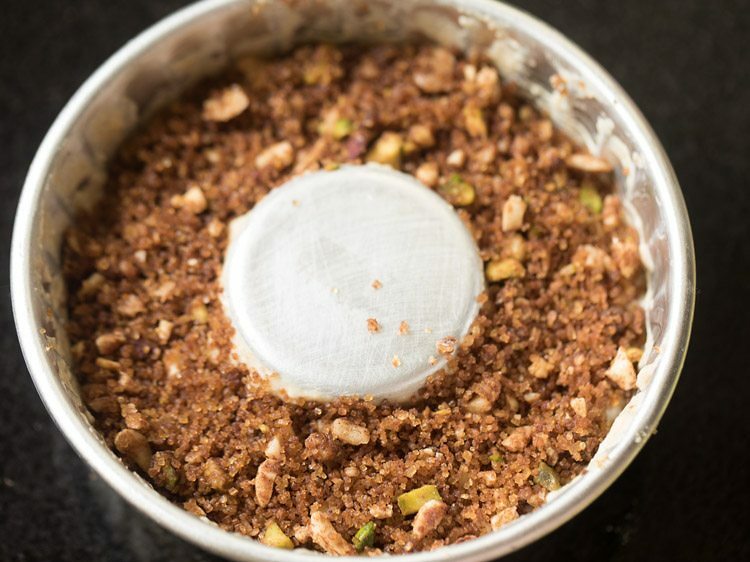 18. now take spoonfuls of the prepared streusel stuffing and top it all over evenly on the cake batter. 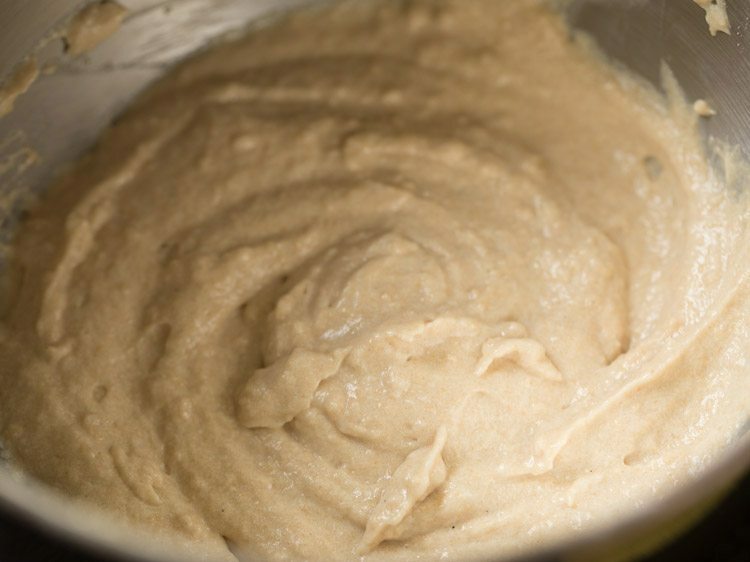 19. again add some batter and fill it till ⅔ or ¾ ᵗʰ volume of the pan. 20. with a spatula make the batter even from top. 21. place the cake pans in the preheated oven in the center rack. if using an OTG, then use the bake option where only the bottom heating element is heated. 22. bake at 180 degrees celsius for 45 to 50 minutes or till the top is golden. since temperatures in ovens vary, do keep a check. 23. to check doneness, insert a wooden skewer in the cake and it should come clean. if there is sticky batter on the skewer, this means the cake needs to be baked for some more time. for cooling keep the cake on a wired rack. 24. when cooled completely, unmould the sour cream coffee cake from the pan. 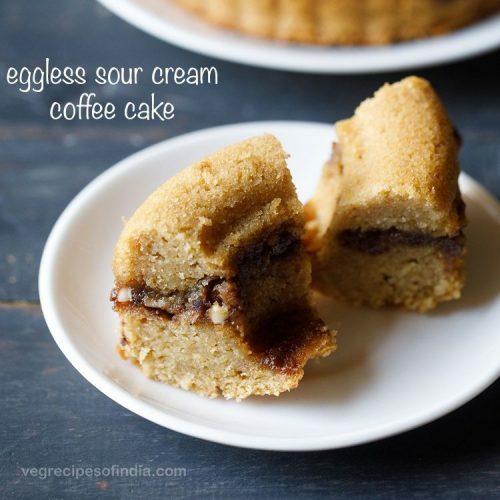 26. serve eggless sour cream cake with coffee or tea or as a dessert. The cake pics are lovely. Would like to try this one. 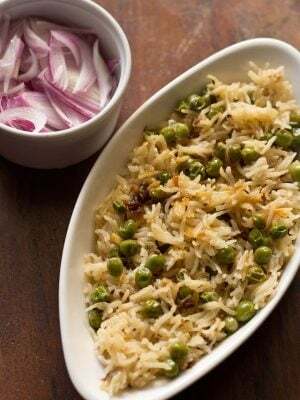 I had some queries regarding this recipe..
3. What kind of cinnamon powder do you use? Is it simply cinnamon sticks ground in mixie.. Thank you for sharing all the amazing recipes! thanks ruchi and welcome. your queries answered below. 1. yes the whole wheat flour in the streusel does get cooked. 2. the cake is lightly sweet but the streusel does add some extra sweetness when eating. so it kind of balances the sweet taste. but for a sweeter cake you can add 1 cup sugar as you are using fresh curd. 3. yes it is cinnamon ground in a mixie. cinnamon sticks that we get in india are of two types. 1. one is cassia cinnamon also known as just cassia, which is not actually cinnamon. most shops or online stores you will get cassia cinnamon which is a cheap substitute of cinnamon. it has a very strong aroma and the sticks are thick and kind of like a tree bark. 2. true cinnamon or the real cinnamon has thin sticks and in a rolled shape, they look like cigar rolls. the aroma is not very strong and intense. i have used both versions and real cinnamon gives a better flavor and aroma than cassia. also cassia cinnamon is not good for health and toxic. so better to avoid. on google, you can get to see both varieties and also get to know the difference. Thank you for the amazing recipe. Can’t wait to try it! One question- Is it necessary to use that kind of cake pan? 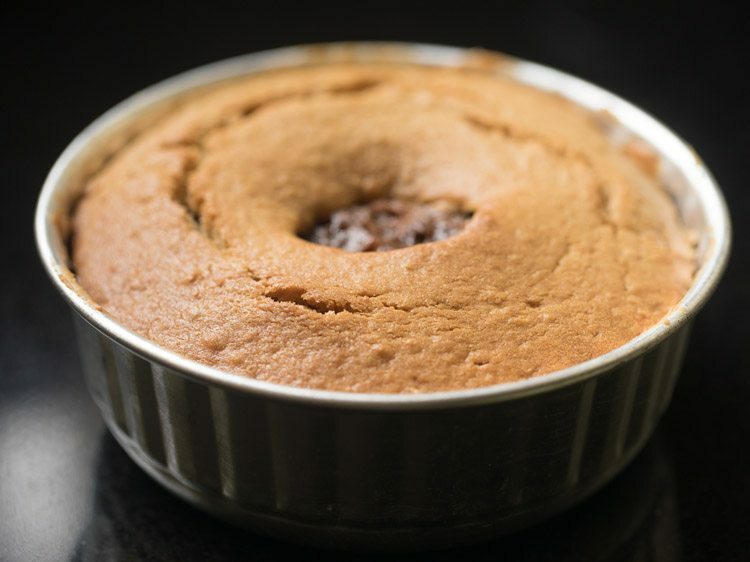 Will it still taste good if I use normal cake pan… or a bread pan? welcome suhani. you can use normal cake pan too. 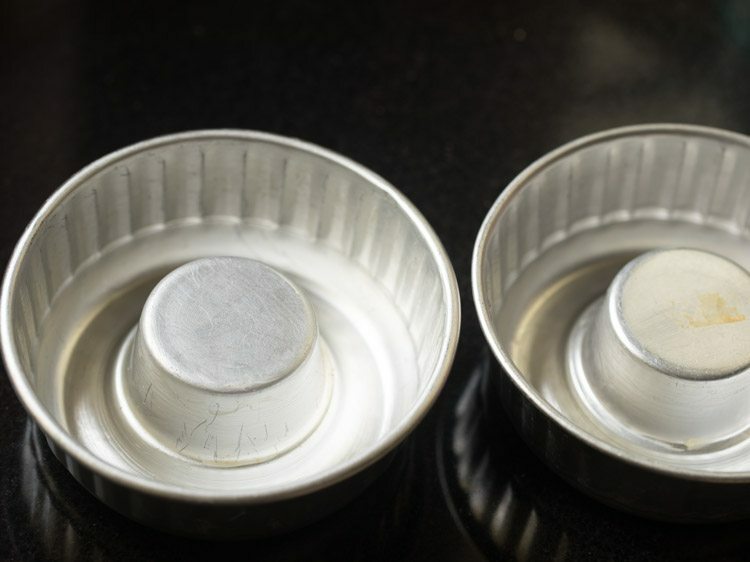 it will taste the same whether bundt pan is used or normal cake pan is used. 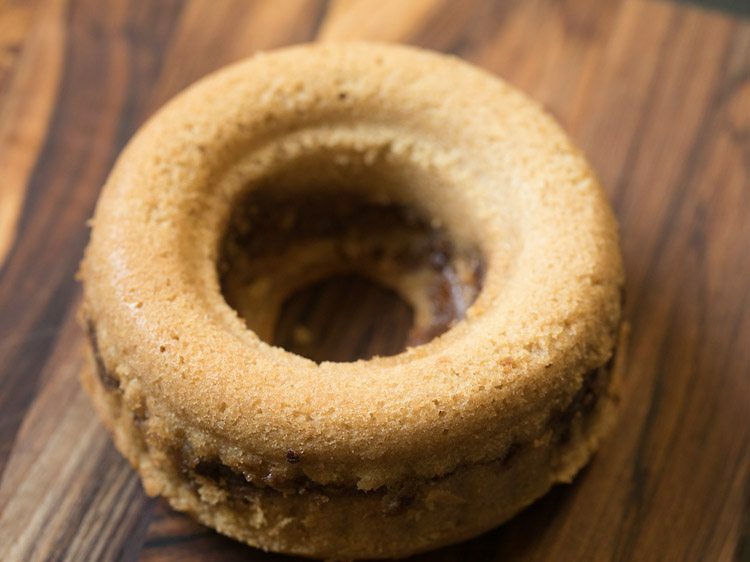 this cake is actually and authentically called coffee cake. but it does not have any coffee in it. i have kept the same title as thats what its known by and so it helps the readers to find the recipe who know the name of this cake. Are there any substitutes for brown sugar? welcome. 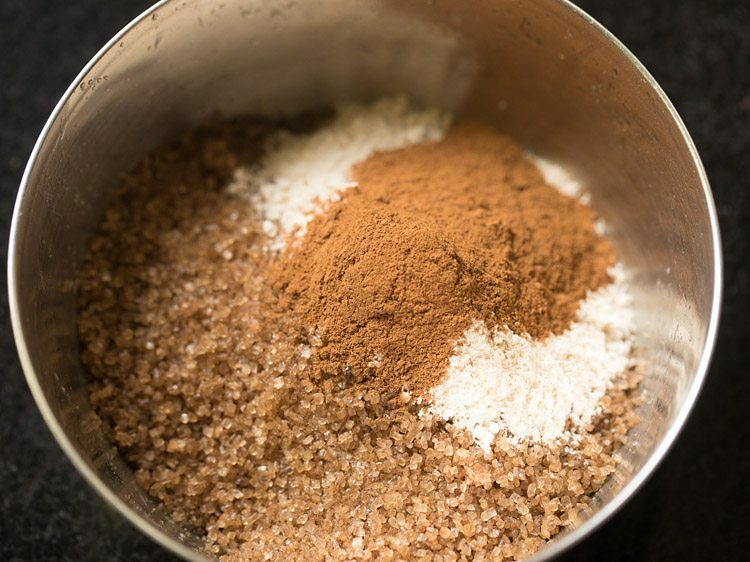 you can use regular white sugar or even unrefined cane sugar. even jaggery can be used. Tried honey instead of brown sugar and made it in a bread pan. Came out delicious!! But honey being heavy sunk at the bottom. Need to get brown sugar for next time. Thanks, Dassana, for such an awesome recipe! I love the fact that you focus on healthy recipes…. using wheat flour instead of maida. thanks for sharing suhani. yes with honey it will sink due to it being viscous and heavy. being a baker, i would not suggest using honey for baking or while cooking. honey on being heated becomes toxic according to ayurveda. even i was not aware of this fact some years back and i would add a bit of honey in tomato based gravies instead of sugar and i have also made brown bread once with honey instead of sugar. but now i do not add honey in baked goods and i always suggest blog readers to avoid heating honey. honey is best had raw plain or with some mixed fruits or cereals. thanks for letting me know sowndarya. nice to know. happy baking. thanks zainab. i have got some requests for sharing gluten free cakes and breads but have never got around making one as the recipe needs to be developed and tested. this takes time. but i have noted down your request and will try to add the recipes.